In a city where skylines seem to change on a daily basis, another project has been given the green light to move forward in Miami. The Miami Planning Advisory Board unanimously approved modifications to a previously approved major use special permit for The Lima Project during its regularly scheduled meeting Nov. 15. The Lima Project, a residential tower and retail area to be constructed between NE 29th Street and 30th Street in the Wynwood/Edgewood area, will consist of a 490-foot, 43-story-tall, mixed-used structure, said Adrienne Pardo, an attorney representing 2937 Ferrari, LLC and 2915 Biscayne LLC, both of which are owned by Yves Barrough and Nancy Karp. The Lima Project is being designed by architect Kobi Karp, husband of Nancy Karp. With a price tag of about $60 million, and expected annual tax revenues of $562,000 for the city of Miami, the building will be comprised of about 206 multifamily residential units, 3,202 square feet of retail space, and 402 parking spaces. “[It is unique because] it is the entire block,” Pardo said. By the entire block, Pardo means that The Lima Project will include the TechnoMarine building that is currently on the site. Built in 1965, this structure was not on the original permit granted in January of this year; however, it is now included in The Lima Project because of a business partnership involving the Starbucks currently sitting on the Biscayne Boulevard side of the TechnoMarine. In addition, the residential tower’s footprints were shifted more than 10 feet, two stories were added to its height and the retail square footage has been altered, according to the project’s documents. These conditions forced the applicants to refile for the permit, Pardo said. The city’s Planning Department concluded that the “property development will benefit the area by creating additional residences in the district.” But city planners added conditions, including that no curb or driveway be cut on Biscayne, but rather that all traffic be routed to either NE 30th Street or NE Fourth Avenue. City planners would rather have storefronts along the boulevard, not driveways, according to a Planning Department analysis. Pardo and her associates tried to sway the board to dismiss this condition, as they felt an ingress is needed to allow cars coming from Biscayne Boulevard to easily turn into the parking area. But both Planning Advisory Board member Robert Young and Chairperson Arva Moore Parks requested that the applicant heed the city’s condition. “I don’t want to harm the project [but I have to agree with staff],” Young said. The board passed The Lima Project item 5-0. Two other projects were deferred to later dates: Columbus Centre, a 56-story mixed-use structure to be located at 21 SW 15th Road, 1450 and 1490-92 S. Miami Ave. and composed of about 219 residential units, 234 hotel rooms, more than 200,000 square feet of office space, about 6,500 square feet of retail and restaurant space, and 596 parking spaces; and 2222 Biscayne, a 29-story building composed of nearly 400,000 square feet of office space, about 6,500 square feet of retail and bank space, approximately 6,700 square feet of restaurant space and 1,784 parking spaces. The 2222 Biscayne project, to be developed at 2220 Biscayne Boulevard by Scott Silver’s Grouper UTD, LLC, will be heard Dec 6. Preparations for Sunday’s election are under way. A fourth Venezuelan opposition party has withdrawn from this Sunday’s congressional election amid a dispute over electronic voting machines. Primero Justicia’s decision means more than half the opposition groupings have now pulled out. Opposition parties are worried the election board could rig the vote. Electoral officials deny such accusations and say voting for the expanded 167-seat Congress will go ahead as planned. The government of President Hugo Chavez has vowed to increase its majority to two-thirds, which would allow it to pass constitutional reforms that opposition leaders strongly oppose. Three other opposition parties pulled out of the poll earlier this week, accusing the electoral body of favouring pro-government candidates. They are the main opposition party Democratic Action, Project Venezuela and the Social Christian party. President Chavez hit back, claiming the opposition was trying to derail the election and accusing them of plotting with the US to destabilise the country. President Chavez’s backers have called a rally on Thursday in support of the congressional election. Washington has said it is increasingly concerned about the state of Venezuela’s democracy, but denies helping the opposition parties. Democratic Action leader Henry Ramos has called for a suspension of the election until equal conditions existed for parties. He told reporters earlier this week that there were software “irregularities” in the electronic voting machines. Mr Ramos also cited lack of access to official voting lists and “deep” mistrust of the National Election Council (CNE), most of whose members are in the ruling party. Mr Chavez’s backers have called a rally in support of the poll Representatives of the electoral council have repeatedly denied accusations of a pro-government bias. Amid a historic building boom, a slew of proposed projects are up for sale. The two-acre parking lot next to the Bank of America Tower in downtown Miami rode the building boom to the top. In 2003, it sold for $8.8 million to local investors. By spring the next year, a development group backed by Latin American buyers agreed to pay nearly $24 million. And just months later, they agreed to flip the land for $46.5 million. The plans were grand, and better still, they were approved: A sleek 746-foot office, hotel and condo tower called Lynx designed by architects Chad Oppenheim in Miami and the two sons of world-renowned I.M. Pei in New York. Today, there is no construction on the site. The deals have collapsed, the buyers are locked in a court fight, and the original owners have the property back up for sale — spiffy building plans and all. Across South Florida a historic building wave is remaking cities and shorelines, but it has also produced a slew of proposed projects — some very ambitious in scope — that are now on the sales block. In some cases, the slowing market killed the projects. In other cases, it was the rising cost of construction, the spike in insurance, novice developers or all of the above. Whatever the reasons, the fervor to build spurred developers to spend millions on land, lawyers, architects and government approvals, only to decide against building. • The soaring 70-story Brickell Flatiron, comprising condos and offices, designed by increasingly acclaimed Mexican architect Enrique Norten. The tower is slated to rise on a triangular parcel just west of Brickell Avenue. • Ellipse, a 266-unit condo fronting Biscayne Boulevard a few blocks north of the Carnival Center for the Performing Arts. • A mid-rise condo tower called Elektra on North Miami Avenue across from the Shops at Midtown Miami. • Onyx 2, a slender high-rise condo on Biscayne Bay in Miami’s Edgewater neighborhood, and Premiere Towers, a condo project comprising two oval condo buildings, next to the restaurant and shopping complex, Mary Brickell Village. Commercial real estate agent Edie Laquer said sales contracts have been signed for these two projects but have yet to close; she refused to disclose price or purchaser. Some of these vacant lots are the forlorn reminders of high-profile flameouts, from a proposed Edgewater condo called ICE to 1390 Brickell Bay, a condo slated for a block off Brickell Avenue. But the fact that a project is for sale doesn’t always mean a business failure, Laquer said — especially if it is indeed sold. One reason for the interest in lots with plans is that, for the right buyer, they present an unusual opportunity to snap up prime property already entitled for building. The approvals can shave months to more than a year from the time between buying and building. Instead of navigating a lengthy process with city planners and political leaders, a buyer with approved plans can line up financing and quickly dig a shovel into the ground. However, the problem is that many of the projects approved in the recent boom were for condos. And some builders — and bankers — want the record spate of condo construction to be digested before putting up more. There are 22,254 condo units under construction in Miami, according to the city’s planning department. That’s compared to 15,525 total units that went up since 1995. Meanwhile, 29,558 condos have been approved by city commissioners for construction, and developers have proposed another 30,674 units that city planners are reviewing. These number say nothing of the building in other towns across Miami-Dade and Broward counties. Some would-be buyers are considering converting already-approved residential projects to other uses, observers say — a reversal of the boom-time trend of building condos on lots previously set aside for offices. Of course, some sellers with lots up for sale are just staying put. For the moment, land prices are holding steady, observers say. That is prompting some owners with staying power to just hold on and let the market to shake out if the right offer doesn’t come along. Caveiro said the betting is that well-designed and well-located projects will keep interest. Trump is building in Sunny Isles. Trump is building big. Sure, when this first became known, it was exciting as hell, but now what? Will the Trump name remain on that rich slither of sand to the north? The Acqualina and Trump Sonesta are built. The Trump Palace and Royale are under construction. Now, work on the three Trump Towers is beginning, but is this the end, or are there bigger plans for the Trump brand in Miami? The Dezers (the father and son duo) are the ones who brought the Trump phenomenom to Sunny Isles. From their initial land acquisitions to the luring of the legendary developer from the Big Apple, the Dezers have been the masterminds. However, it is the Trump brand that all the projects base their features and marketing on. The Acqualina is a private Vegas caliber resort-like ultra luxurious community minus a casino. The Trump Sonesta is an exceptional addition to Miami’s luxury hotel market. The Trump Grande and Royale are going to be the most distinguished monoliths in the Sunny Isles skyline. The building designs alone are a marvel. To think of the impact that the Trump Towers are going to have on Sunny Isles is mind boggling. Donald Trump’s name is all that is required. It connotes opulence, exclusivity, and high quality. Not a hard sell. Nothing needs to come out of his pocket. His is a franchise of mega developments with the Trump brand. Retaining the perception of extremely high value has to be the highest priority for the Trump brand. This makes the stakes of a Trump project all that higher, because of the hype, expectations, and typically massive project scope. A Trump project is good for the city in terms of generating tax revenues and attention. Three Trump projects are excellent. Seven, is well, ridiculous. Yet, why is the Trump brand confined to Sunny Isles? Sunny Isles is on the Ocean, between Miami and Ft. Lauderdale, and doesn’t have the permitting red tape of its municipal counterparts to the south. Could these all be reasons for Trump’s involvement or could it just be that the persuasiveness of the Dezers plus the appeal of their oceanfront properties pulled him in? It doesn’t matter. There are 7 major Trump projects in Sunny Isles. The Trump name is consuming the former motel dotted beachfront city. No longer are the Related Group’s Ocean 1, 2, and 3 projects enough to dominate the Sunny Isles skyline. The addition of Ocean 4 is not going to change the status quo, which is that Trump rules. Through a development standpoint, the Dezers brought Trump to town. What happens if Trump’s brand escapes Sunny Isles and into Brickell Village or the CBD? What about South Beach? Currently, Trump’s brand of development is confined to one small beachfront municipality, but it is tempting to consider what would happen if it wasn’t. Jorge Perez’s developments have been eclipsed by Trump’s in Sunny Isles. 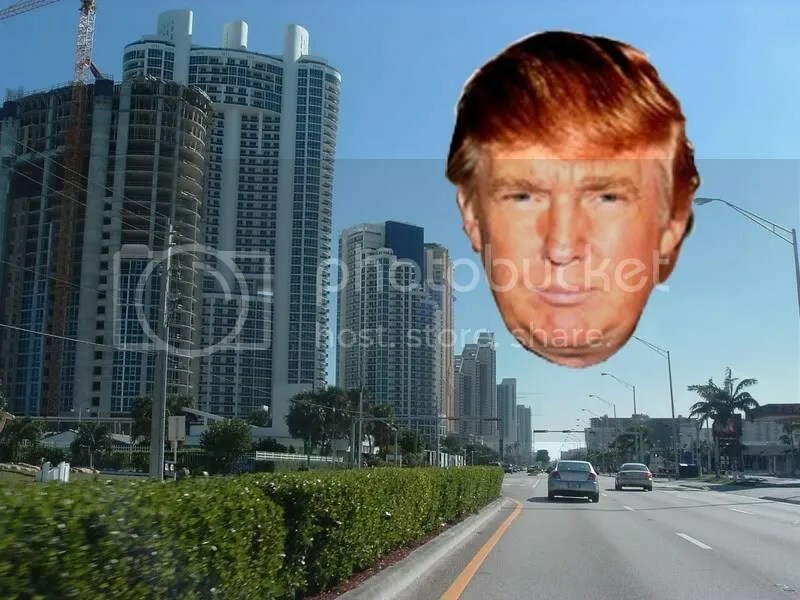 Could the Sunny Isles market be a microcosm of what would happen if Trump broke into Miami’s more competitive and developing urban real estate market? At this point, it’s too late to get into the saturated South Beach market. Jorge Perez has dominated SoFi. Although there are several significant developers active in Miami right now, Jorge Perez is probably number one in terms of quality, consistency, selectivity, quantity of units built, among other factors. 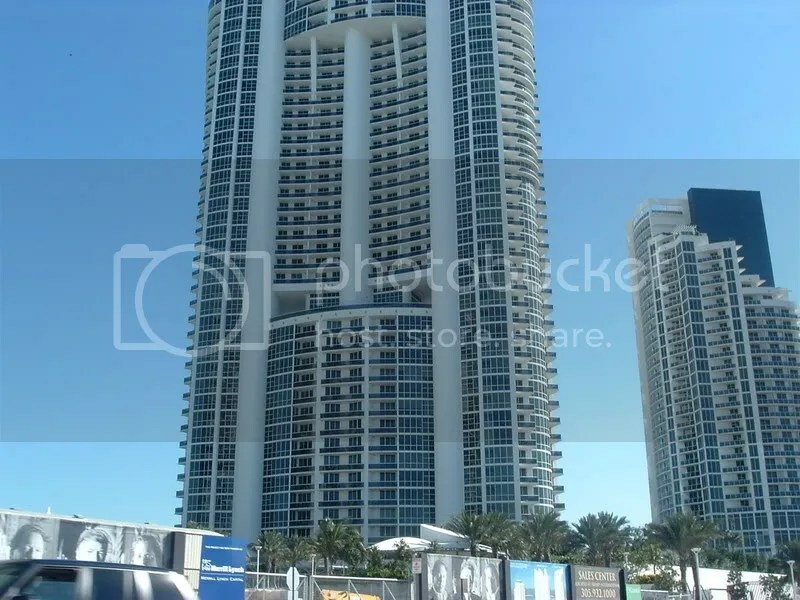 Mr. Perez’s towers ruled over the Sunny Isles skyline, but now they will stand among the three Trump Towers, Royale, Grande, Sonesta, and Acqualina. They may even go unnoticed. Still, it would be nice to see the Related and Trump brands compete in Brickell, South Beach, or the CBD. Although there is nothing to indicate that this will happen, the possibility is not remote. The two juggernauts have already had at it in Sunny Isles, which is already becoming Trump-town.